(Dec 5, 2015) "Kids having fun playing the game of soccer." 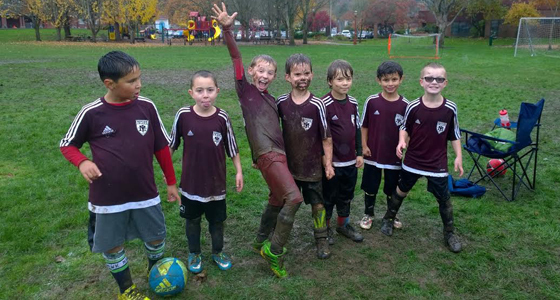 That description comes straight out of the EYSA Futures playbook as envisioned by our Board at the beginning of the season, and that's exactly what we saw as the EYSA U8-U10 regular season wrapped up on Saturday and Sunday, Nov 7th and 8th, across Bellevue and Issaquah. 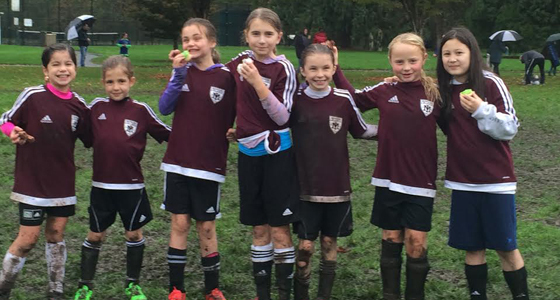 The rain came down hard over the weekend, making for challenging field conditions, but spirits ran high as players gave their best efforts, putting together all they learned throughout the fall season. Kendra Campbell of EYSA, who organized the event, reinforced what we heard from coaches and players throughout the weekend. "Despite the non-stop rain and chilly temps, the players seemed to have a blast! I saw more than a few after-game mud slides - both with the kids and coaches! I think overall - it was a great way to end the season." Teams in the year-end jamboree faced some of their best competition, with like-v-like parings based on earlier league results. Using a weekend jamboree format to wrap up the season allowed EYSA to avoid pushing the season further into November with minimal light for after-school practice and the inevitable poor field conditions due to weather. Plus, it's a lot more fun when we get to see our young EYSA soccer community out in force!